The brewing process went will, although I would later realize after bottling that it came out really dark for a Blonde when compared to one of my favorite Blonde beers, 805. Even so much that I inadvertently started calling it an Amber. One of the projects I had undertook before this brew day was the construction of a fermentations fridge. In what I can only describe as fate, a few months before this brew day a friend had asked if we wanted their wine fridge of 10 years for free. It was slightly noisy, but nothing that would keep you up at night and couldn't beat the price. When I realized I should convert the wine fridge, I started searching online. I ended up buying a two stage warm/cool temperature controller from MoreBeer. I cringed at the thought of spending a $150 for it, but I figured the fridge was free. I later realized I could have built one for a lot cheaper, but knowing me it would have been many months before I finished the project. After hookup up the controller and putting wires through the foam, I had the perfect fermentation fridge that was less needed in March, but certainly was needed during the summer in our non-AC house. 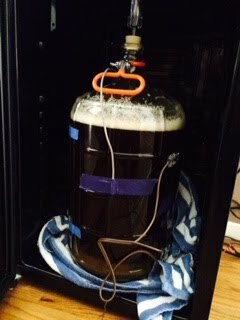 I had taped the temperature probe to the side of the carboy because the thermowell I wanted from MoreBeer wasn't in stock. I like the one with the stopper on top, not the hood. Personal preference. The beer in the end was ok. It had a buttery note to it and I wasn't thrilled with the color and flavor, but for my first beer, it was a success. I didn't kill it.